Well I think I’ve found my electric vehicle. It’s called BugE Electric Motorcycle, a light-weight reversed trike electric motorcycle designed by Blue Sky Design, LLC. It was originally designed to take 4 12V 55AH lead acid batteries for a total of 48V. The same footprint should hold 15 LiFePO4 cells, 3.2V 100AH for the same 48V and twice the amp-hour capacity. This pack would be considerably lighter and last for many years of regular use. Assuming the same 55W/mile average of the original design and an 80% depth of discharge, this would give the BugE Electric Motorcycle a safe range of about 70 miles. Also assuming an 80% DoD, charge time would be around 2.6 hours using an Elcon PFC 1500 battery charger at 120VAC (half that at 240VAC). I make the assumption the power consumption would remain the same based on about 100 lbs lighter battery pack, and about 100 lbs heavier driver (me). A lighter person would likely get better power consumption. That and it really depends on how you drive it. I’ve been looking for a light vehicle to use as a base for an Electric Vehicle Conversion. 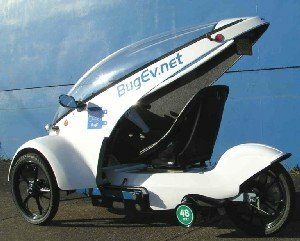 The BugE Electric Motorcycle certainly fits the bill, and it’s designed as an Electric Vehicle to start with. The only changes I’d really make to the design are the battery chemistry and choice of battery chargers. I would not use a battery management system (BMS), as I’ve seen quite enough evidence that they’re both unnecessary and potentially hazardous (both to the batteries and as a fire hazard). Bottom balancing and a slight undercharge with an intelligent charger like the Elcon series should be sufficient. For a total of $8,404.96, roughly rounded up for the battery straps and NordLock washers to $8,500. So if shipping costs can be kept under $1,500, you’re looking at a fully functional and really cool looking Reversed Trike Electric Motorcycle for under $10,000! Eat that GM and Nissan!